Originally made in two weeks for the YoYo's BetaJam (In which Forager took second place!). Explore procedurally generated lands with designs created by hand. 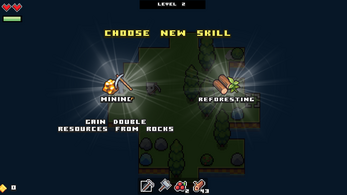 Forage and mine for common and rare resources. Craft powerful and interesting items. Build your base with many different structures. Trade and build up an economy to expand your empire. Meet NPCs, enemies, bosses and playful fairies. Level up and learn new and cool skills. Solve puzzles and find treasure! PLAY THE (OLD) DEMO FOR FREE! 1. Select a building for placement, then cancel the placement with "E" or escape - if the building was hovering over water tiles they become walkable, and you can't build a bridge over them. 2. Somehow I got a duplication bug of my wheat seeds, which filled three of my slots, and therefore I couldn't pick up other resources not already in slots - for example, I was loosing gold. It was getting sucked into me, but not stored in my inventory. 1. The same way you keep the tools on the front of the toolbar, you can keep the edible foods after the tools and not have a mess of "ore-food-wood-food-ore-food"
3. This, I feel, would really be a quality of life improvement, but not sure if it's worth the effort to implement: bind "go to here" style controls (a-la Diablo) when the player clicks on something that's out of the range, or just empty ground. So far I haven't seen much reason for WASD controls. Cheers! Looking forward to this escaping the demo stage! The first two bugs are fixed in the update I am working on (should be out next weekend for subscribers of my mailing list). The item ordering thing is a quite interesting suggestion. I did it with the tools because I figured it would be easy to just press 1 and mine something or press 2 and quickly build stuff. You are right though, I don't see why I couldn't just order everything since at one point you have so many items it can get confusing to identify where ores/materials/foods are. I will look more into this! As some of you may have already noticed, the whole skill system is currently being reworked for future versions of Forager. The Alpha Demo on Itch.io will still contain the old skill system, while people subscribed to my mailing list will get to help me test the upcoming versions with the new system included! When enough experience is reached, players level up and get a choice of two random skills from an available skill pool. The old skill system had a few things I personally liked, but after a bunch of testing players brought to my attention a series of flaws and issues that I had overseen. Random elements incentivize replayability. It's also very fun to wonder what are you gonna get next. Easy to implement and expand. I was reusing code from another game (Impossible Dungeons!) and the system was both proven to work fine and proven to be fun. Random skills can be useless or unexciting. You may be level 10, with an expanding empire in need of trade and coinage and suddenly get the choice between "better berry picking" or "faster building times", none of which is of use to you anymore. The system doesn't leave much space to playstyle choice. 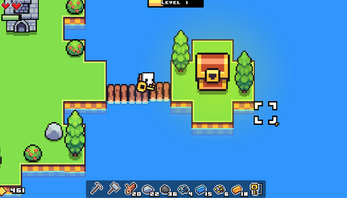 When I first started Forager, there wasn't a whole lot of different ways to play the game; you would just hit stuff and use the resources to build things. Now the game has gotten bigger and more polished, and there are several ways to approach gameplay. 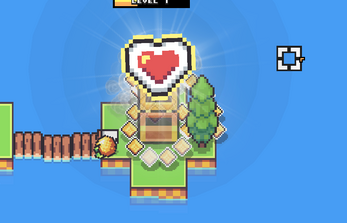 Players may want to focus on building a nice village, so they want to pick building and decoration related upgrades. Or maybe they prefer to raid dungeons and fight bad guys, in which case structural decorations are less useful to them than say, weaponry or combat upgrades. There is no clear sense of character progression. Players not always feel like they are getting stronger or better at the game when skills don't scale off previous ones. After a lot of discussing with the testers, I have come to the conclusion that a traditional skill tree-type of system would solve all of these issues while still providing a sense of replayability. Players will now start with a choice of four possible paths (Building, Magic, Combat and Foraging). Upon learning a skill, the adjacent ones become available for learning in the future. The new skill grid system allows for much more flexibility in regards of choosing a playstyle. You may start with Combat, which unlocks Hunting and Strength. Then, after choosing Hunting, you would also unlock a skill for the Foraging branch! (Since every learned skill unlocks the adjacent ones, regardless of specialization). This new system really promotes hybrid playing styles, and it remains replayable because you are most likely not able to learn the whole skill grid in a single playthrough. This is what the 64 skill grid looks like! That's all for now! I am really looking forward to you guys testing this new system out! The next test build should be ready for the next weekend (of Friday 23th of June of 2017). IF YOU WANNA TEST THIS BUILD OUT, YOU HAVE TO BE SUBSCRIBED TO OUR MAILING LIST! OMG! This style is amazing! The animations are super-fluid and the colors so strong!!Wow. Is the demo also on indiexpo? Definitely keeping an eye on this, the art and animations are great and it looks like you're really taking the time to think about the design and refine where necessary. It's so tempting to leave things at "just about good enough". This looks so good man, loving the style and the concept! There is a new build to test coming out this Friday (23th of June)! It will be available to play and test for subscribers of the mailing list. This is wonderful! I like the more freeform skill grid! New Forager version is out for everyone subscribed to the mailing list! How do I sign up to test? We usually have a new version to test every 2 weeks. Signed up! This looks super fun :D.
Games like these are really inspiring to look at.